So what's a better way to spend a Thursday morning than with a delicious and aesthetic brunch setup at the renowned Fig & Olive in Melrose Place in addition to taking home your very own Lola Camera Bag from THACKER NYC? Honestly, we couldn't think of a better way to spend a weekday morning! Since the team at iRose Social is all about hosting intimate events where our influencer attendees can take home amazing memories, newly made connections, and fun goodie bags, we had an amazing time organizing this event from beginning to end. Keep reading if you want in on the full scoop of this influencer event! We allowed our guests munch on delicious Crostini appetizers and mingle amongst themselves before playing a fun icebreaker game to introduce everybody to one another. Over cocktails and a few laughs, the room was filled with good vibes and positive energy once everybody shared a fun fact about themselves. Throughout the meal, our resident photographer captured fun behind-the-scenes images in addition to doing an exclusive 1-on-1 editorial photoshoot with each of our influencers. 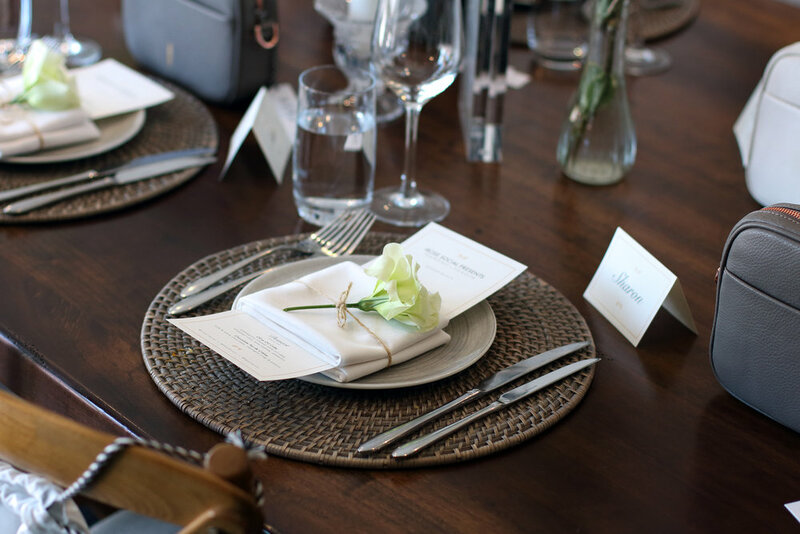 At Fig & Olive in Melrose Place, we reserved the private Garden Room for an exclusive and intimate blogger brunch. On every seat, we placed a personalized name card, one Lola Camera Bag (with a Twyla Twilly Scarf inside the bag!) from THACKER NYC, and one customized menu. In fact, we designed our tablescape to radiate a fresh summer theme with beautiful floral arrangements and customized menus that included accents of white, orange, and green. As soon as our influencer attendees arrived, our friendly and attentive Fig & Olive waiter, Cyrus, made sure that everybody's needs were accommodated throughout their entire meal. We allowed our guests munch on delicious Crostini appetizers and mingle amongst themselves before playing a fun icebreaker game to introduce everybody to one another. Over cocktails and a few laughs, the room was filled with good vibes and positive energy once everybody shared a fun fact about themselves. Throughout the meal, our resident photographer captured fun behind-the-scenes images in addition to doing an exclusive 1-on-1 editorial photoshoot with each of our influencers. Soon after, the main course was served followed by an exquisite dessert. Everybody was pleased with both the aesthetics and quality of the entrees served at Fig & Olive, and we made sure to communicate this strongly to the staff who were helping us out the entire day. Lastly, the iRose Social team wanted to say a special thanks to both THACKER NYC and Fig & Olive for partnering up with us on such an epic event! Be sure to follow along on @irose.social for frequent updates and check out our HIGHLIGHTS REEL called "fig&olive" on our Instagram page for behind-the-scenes photos and clips!